While many researchers have devised ways we might use Mars' carbon dioxide to terraform the planet and make it habitable, one new study suggests that the Red Planet simply doesn't have enough carbon dioxide for this to be possible. Could we make Mars Earth-like? Not with existing technologies, one new paper suggests. For many years, Mars has existed as a hopeful "Planet B" — a secondary option if Earth can no longer support us as a species. From science-fiction stories to scientific investigations, humans have considered the possibilities of living on Mars for a long time. A main staple of many Mars-colonization concepts is terraforming — a hypothetical process of changing the conditions on a planet to make it habitable for life that exists on Earth, including humans, without a need for life-support systems. This artist's illustration shows Mars' polar ice cap in the beginning of the southern hemisphere's spring. Mars' polar caps have a significant amount of carbon dioxide but not enough to terraform the planet, according to a new study. To successfully make Mars Earth-like, we would need to raise temperatures, have water stably remain in liquid form and thicken the atmosphere. In the paper, Jakosky and Edwards explained that, by using greenhouse gases already present on Mars, we could, theoretically, raise temperatures and change the atmosphere enough to make the planet Earth-like. The only greenhouse gas on the Red Planet that's abundant enough to provide significant warming is carbon dioxide (CO2), they noted. Unfortunately, they found, there just isn't enough CO2 on Mars to make the planet Earth-like. On Mars, CO2 is present in rocks and the polar ice caps. Jakosky and Edwards used data from the various rovers and spacecraft observing and studying Mars from the past 20 years to essentially take an inventory of the planet's stored CO2. They documented all of Mars' surface and subsurface CO2 reservoirs and how much of the gas exists and could be put into the planet's atmosphere to change it. However, while there is significant CO2 on Mars, there is only enough accessible CO2 to triple Mars' atmospheric pressure, Jakosky and Edwards found. To successfully terraform Mars, the atmosphere would need to be raised enough so that humans could walk around without spacesuits. But although tripling the Red Planet's atmospheric pressure might sound like a lot, it's only one-fiftieth of the CO2 necessary to make the atmosphere habitable to Earth creatures. Additionally, the amount of accessible CO2 the researchers found would raise the planet's temperature by less than 18 degrees Fahrenheit (10 degrees Celsius). And because temperatures on Mars average minus 80 degrees Fahrenheit (minus 60 degrees Celsius), with winter temperatures plummeting low enough for CO2 in the atmosphere to condense into ice on the surface, it wouldn't make enough of a difference, the study authors said. Moreover, even if there were more CO2 on Mars, most of it would be very difficult to access, and it would take a lot of effort to release that gas into the planet's atmosphere, according to the paper. For example, CO2 could be released from the polar ice caps by detonating them directly with explosives — an option favored by SpaceX CEO Elon Musk — or by using explosives to raise dust in the atmosphere so it would land on the polar caps and increase the amount of solar energy they absorb, according to the paper. There are a number of suggested and theorized methods for humans to access and release CO2 on Mars. But many of them would be very difficult, and as Jakosky and Edwards found, it still wouldn't be enough CO2 to terraform the planet. 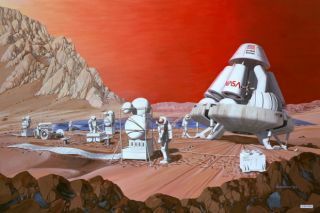 Both Jakosky and Edwards told Space.com that perhaps future technologies will find an alternative solution and make it possible to terraform the Red Planet. However, "with current technology, we just don't see that there are any viable options," Edwards said. Mars has been the "obvious" terraforming choice for many years. This is due to a number of reasons, including that Mars is so close to Earth (relatively), it's the "easiest planet to get to, and it's the only planet that you can describe as having a climate where we could get down to the surface today and function there," Jakosky told Space.com. The allure of terraforming Mars is perhaps "part mythology as well. There's been a lot of science fiction written about Mars," Edwards added. However, although future technologies may allow humanity to change Mars in ways not possible today, instead of focusing our efforts on making Mars into Earth 2.0, "I think our efforts are better spent making sure Earth keeps its pleasant clement environment," Jakosky said. The paper was published today (July 30) in the journal Nature Astronomy.